There are hundreds of thousands of fish in the world, and several thousand that are commonly seen in lakes and streams, and hundreds that are kept as aquarium pets, such as the Sharp-Tooth Tetra and the Striped Sleeper Goby. They usually go by their common names, but if you want to research your fish, knowing the scientific Latin name of the species is helpful. This is a list of fish with names beginning with the letter 'S'—arranged by common name, with scientific names also given. Hyphessobrycon eques. This is part of the group of tetras known as the "blood tetras," due to its color. This species, from Brazil and Paraguay, grows to only about 1.75 inches, is a peaceful and social fish, and is very easy to care for. 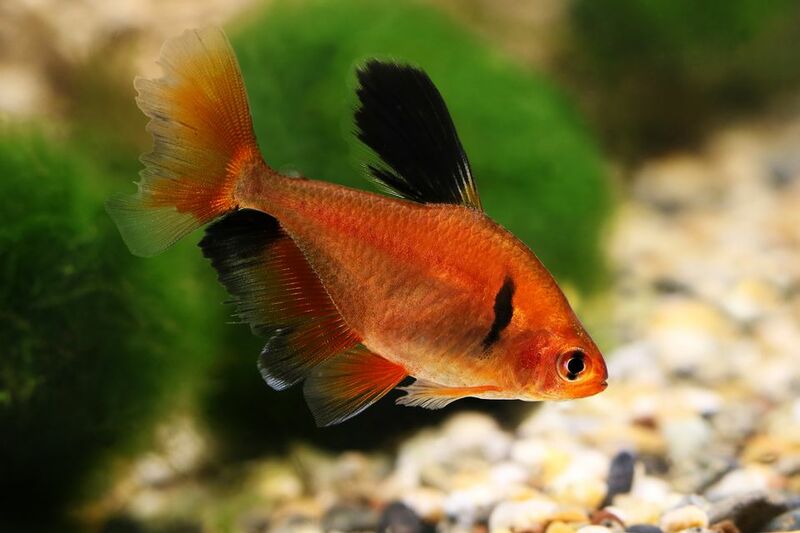 Although it needs tankmates, avoid putting it in aquariums with smaller fish, as it can be slightly aggressive and may nip them, especially at feeding time. Because it comes from the Amazon region, it prefers dark waters; using a dark substrate on the bottom of its tank may make the Serpae Tetra more comfortable. Betta splendens. Also often known simply as a Betta, is perhaps the world's most popular species of Betta for aquariums. The common name derives from the fact that males put in the same tank will spar—mixed genders do fine, but don't put two males together. They are often placed in small bowl aquariums, but this is probably not the most humane environment as they prefer tanks at least two gallons in capacity. Rarely getting more than 3 inches long, Betta spendens doesn't live more than two or three years in normal circumstances, but the bright color and long flowing fins of the males still make this a very popular fish. Trichogaster trichopterus. There are several names for this species, including Blue Gourami, Three-spot Gourami, and Golden Gourami, but by whatever name this is a very popular aquarium fish. It grows to about four inches in size and is very easy to care for. A silvery blue in color, they become a darker blue when spawning. Gourami are highly social fish, but it is best to keep them with fish of roughly their own size, as they can be territorial and may bully smaller fish. Serrasalmus serrulatus. This is a large, unique specimen that will be a conversation piece in any home aquarium. It grows to almost 15 inches in size and requires a large (20 gallon or more) tank with well-circulated water. It is an aggressive fish, so it should be kept only with fish its own size or larger. The Serrated Piranha will eat a wide variety of foods, including vegetables and aquarium plants. Decorate its tank with caves and other hiding places.